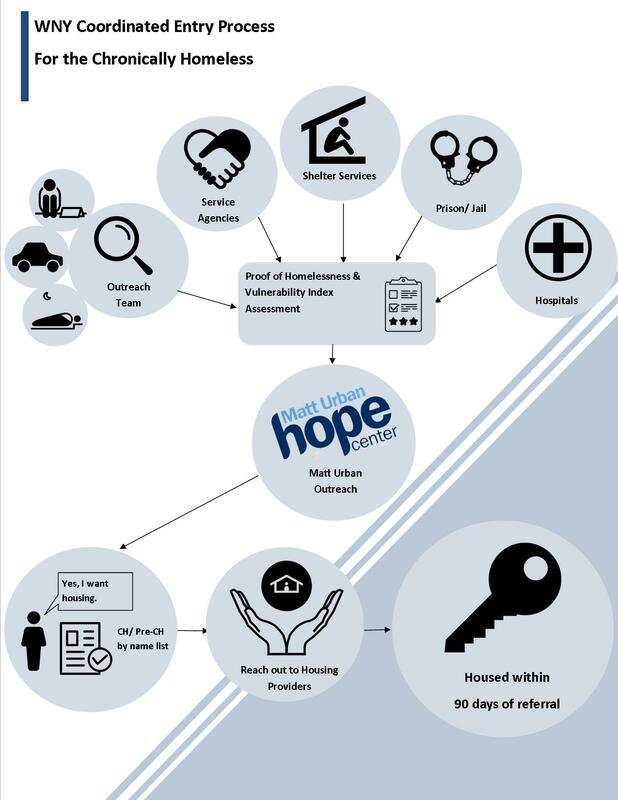 An effective coordinated entry process evaluates and connects those most in need in the community with the most appropriate available resources for their situation as swiftly as possible–the process should be low barrier, housing first oriented, person-centered, and inclusive. HUD’s primary goals for coordinated entry are that assistance be allocated as effectively as possible and that it be easily accessible no matter where or how people present. 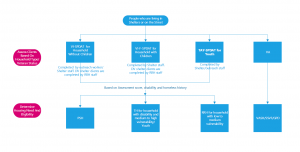 In the coordinated entry process clients all receive the same assessment (depending on their household type) at the shelter point of entry and are prioritized by highest acuity. 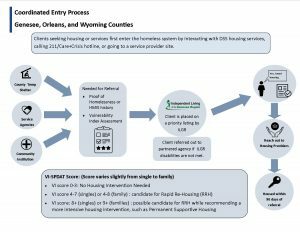 The assessment tools used for coordinated entry are intended to help guide case management and improve long term housing stability outcomes. Please see below for the assessment tools used by providers in the CoC, the Coordinated Entry Written Standards, and further resources and information about the coordinated entry process. Due to the fact that New York State is a “right-to-shelter” state, we do not prioritize client for shelter. Everyone who needs shelter can request it through the County Department of Social Service or go to certain shelters who take walk-ins. Shelter placements are made on the day of the request. All CoC and ESG funded partners use the Vulnerability Index-Service Prioritization Decision Assistance Tool (VI-SPDAT) that was developed by OrgCode Consulting, to prioritize clients based on vulnerability. Through the use of the prioritization tool, chronically homeless or people with an extended homeless history, DV victim, veterans and families who score highest in vulnerability are prioritized. All ESG and CoC funded Rapid Rehousing and Permanent Supportive Housing programs are required to participate in coordinated entry. Our Coordinated Entry (CE) system operates as a mix of approaches, including “No wrong door”, multiple “Hubs” and outreach. 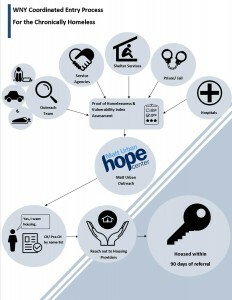 The majority of the clients are assessed by shelter staff within 7 days from the date they enter shelter. Clients may also go to certain locations(hubs) to complete the assessment. In addition, Street Outreach teams spend time in the street, in bus stations, public libraries, parks and other locations regularly assessing client where they are, during nontraditional hours. Community partners, including Health home care coordinators, hospital discharge planners and others can also complete the VI-SPDAT and refer clients directly to the Coordinated Entry coordinators. All data, including vulnerability scores and assessments, are entered into HMIS. The Coordinated Entry coordinator then uses the HMIS generated reports to prioritize clients and make referrals. Details of the order of each type of program prioritization are described in our CoC Written Standards. 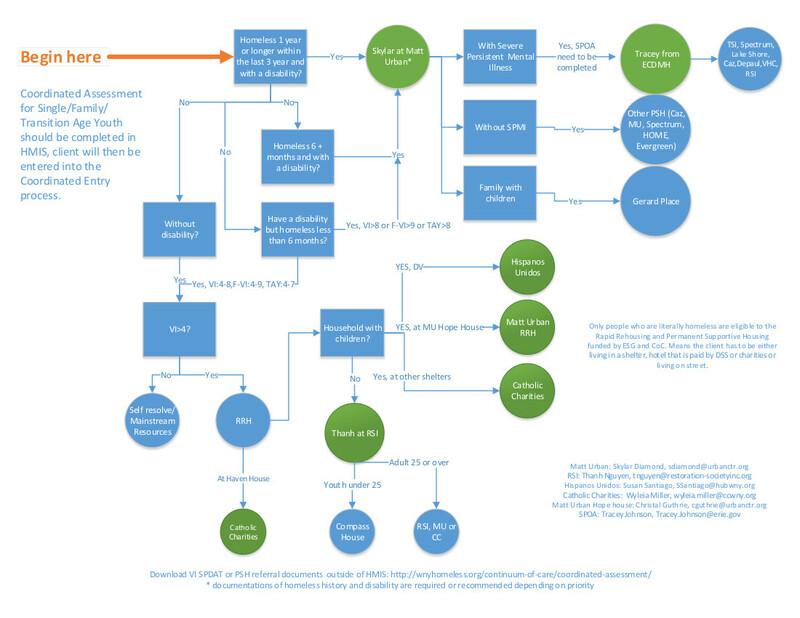 HUD’s Flowchart of the Definition of Chronic Homelessness.